He was in most of the publicity shots - like the one above - and was "The Father of the Program". But this is about - the "other" George - George F. Stecher! 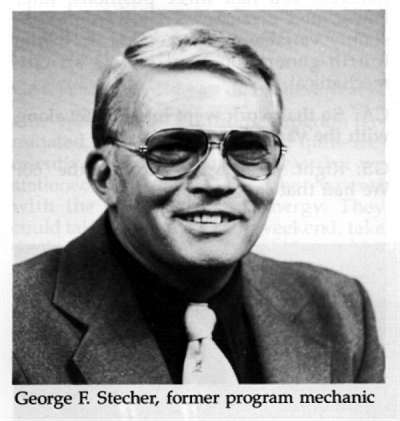 George Stecher was one of the real people who made the program work. He started working at Chrysler before he was given a free tour of Korea from his Uncle Sam. After his tour of duty was done, he came back to the company where he was given a few basic jobs like testing brakes. 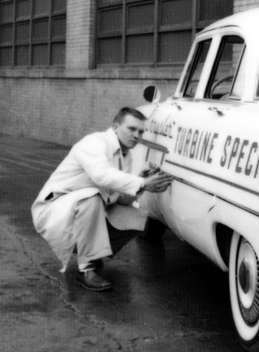 Someone must have seen his potential because after about three months of brake testing he was offered a job - to "build a turbine car" - to which George replied "I don't know anything about turbine cars!" the answer from his boss was "Nobody else does either!" 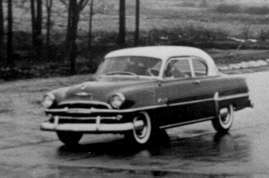 That was in the summer of 1953 and the other George (Huebner) had the infant program ready to test an engine in a real car - a 1954 Plymouth. From that first test car to the last prototype in 1981, George Stecher was one of the guys getting his hands dirty and building the cars. George was part of the Highland Park group. This is where all the advanced engineering took place at Chrysler. For every project you needed more mechanics than engineers. It is the mechanic who can make what a designer or engineer dreams of into something we can see and touch. They work in the background and don't get much glory. They are also people who know how to "make things work!" 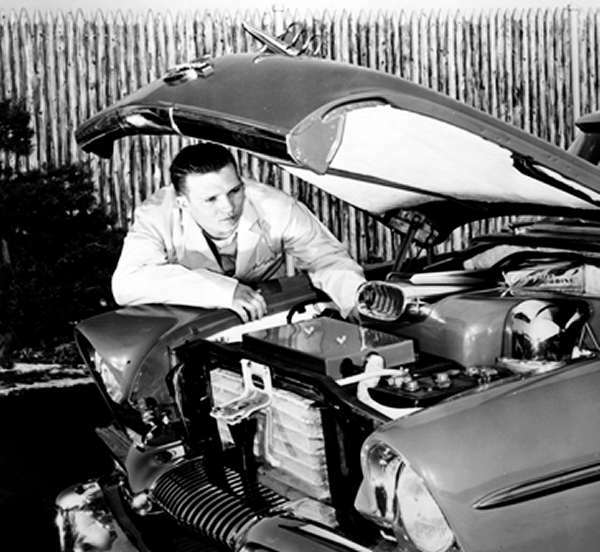 Above, George checks out the last minute adjustments on the 1955 Plymouth turbine powered car. George was there on the cross country trips, the publicity shows and just about whenever the program tried something new - George was there. 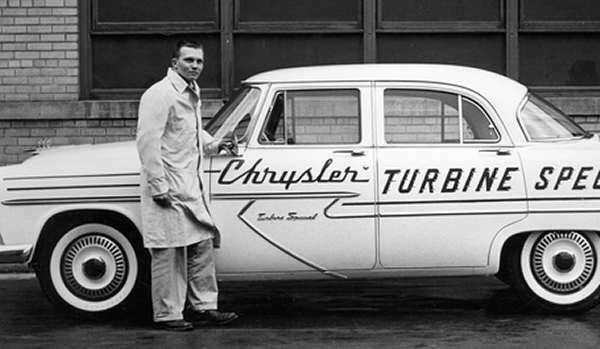 Cars would be taken from inventory and modified - not only was the turbine engine installed but many cosmetic changes were made to make them unique. In the above photo, George is checking the alignment of the lettering added to a 1956 cross-country car. Special trim and even special hubcaps made the car easy to identify. Chrysler wanted the people to know - this was a special automobile. Here is another shot of George with the car before it went coast to coast. George Stecher became "almost famous" in the 60's. A movie from Universal Studios called "The Lively Set" was filmed. Chrysler used this movie as a showplace for the Turbine Car and turbine power as being the "Future". When they loaned the car and a lot of other stuff as props to the movie company, they made one stipulation - only their man - George Stecher - would drive the car. They wanted to be sure if any problems came up that the best guy to fix them would be there and they wanted to be sure the movie company did not destroy their car before they were done with it. George was probably the only Chrysler employee to become a member of the Screen Actors Guild. While in California, he got to meet some very interesting people (beside the movie starts) including Mickey Thompson, Dave McDonald (Dave was killed a few months later in a crash at Indy. this was before the movie came out and they had to cut his close-ups from the film), and Eddie Sachs (Sachs was in the same crash that killed Dave). The filming started in early 1964 and took about three months. George was away from his family for that whole time. He got called back to film replacement footage for the part with Dave McDonald in it. The film company thought it would be poor taste to have him Dave in the film considering his tragic death. Some of the those scenes were filmed with George at the wheel of all the cars - one at a time - not just the turbine. Who needs actors when you have a good mechanic to make it work. This was the Famous #5 Casey Owens Special. 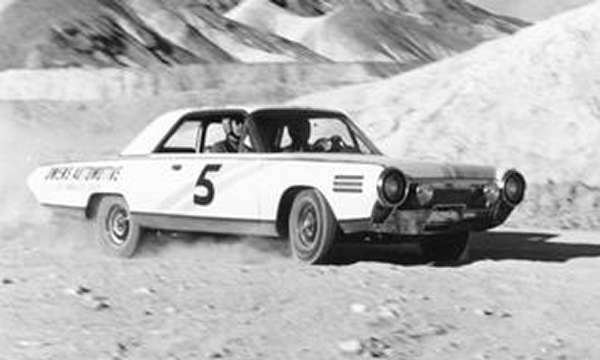 Here is a shot of George behind the wheel - back at Chrysler. Above is an action shot with George at the wheel. The movie kind of banged up the car a even with George there and since it was crushed with the rest of the cars when the corporation decided the program was over it was no big deal I guess. Chrysler continued the turbine program after the Ghia cars were crushed and in the early 70's they entered into a contract with the E.P.A. and N.A.S.A. to come up with a turbine powered car that would meet all energy and pollution requirements. 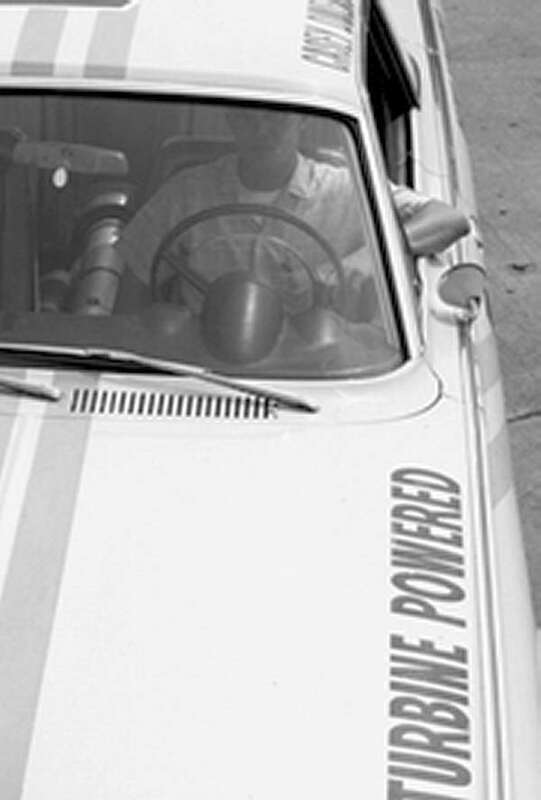 In the photo above, George is standing in front of one of the early 70's test cars. Those were pretty much just plain looking Dodges and Plymouths. Those cars along with some Dodge Aspens spent a lot of time around the Washington DC area. They even were in the Government Motor Pool fleet for a while. All during this time - George Stecher kept them running along with his crew. 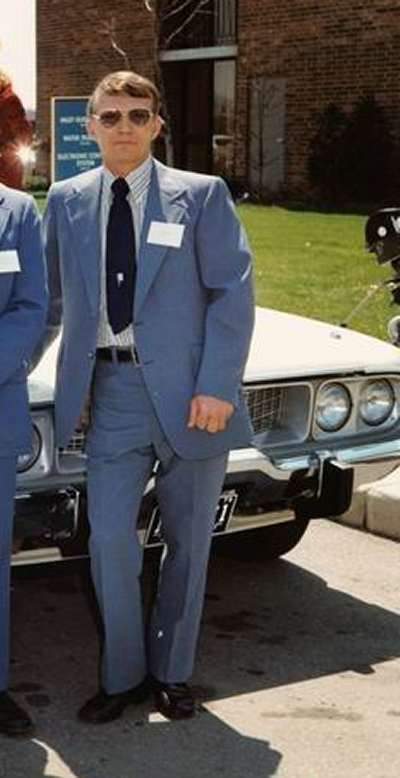 George retired in 1990 from Chrysler with over 40 years of his life spent there. Much of it - from 1953 to 1981 was with the turbine program. 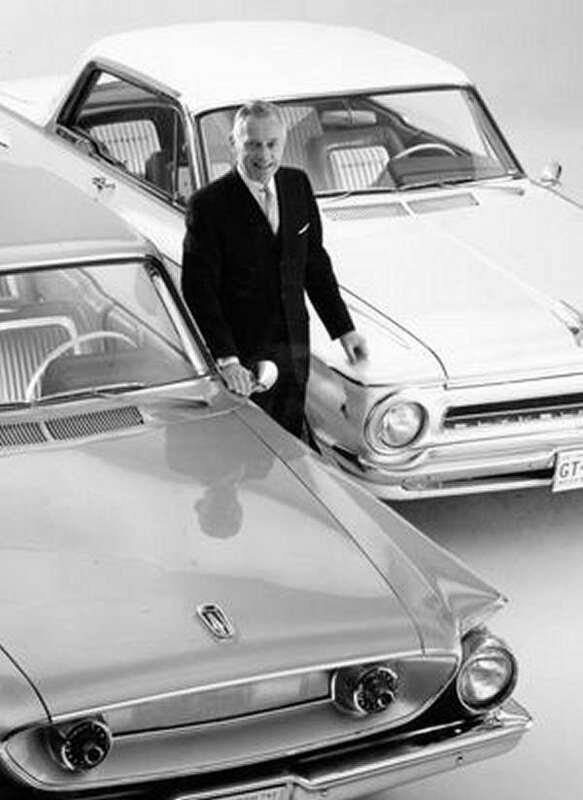 For George the program was so much a part of his life that when it was scrapped like the 1963 Ghia cars were - he and his close friend spent the good share of that first night in tears of frustration and sadness. Click here to return to the main page or use the Back Button.